Welcome back to Part 19 of The Accidental Remodel! I knew I would have to replace the outlets and switches over the counter because of the new white cabinets, but when I got shocked on one doing the backsplash, it was no longer cosmetic. We also need to have one outlet moved to the bay window for my office since the new cabinets, if they ever come, will permanently block the existing one. I also need the DSL moved from by the door to under the baby for the office too. With the new cabinets going to the ceiling, it is no longer even possible to drape it over everything to get to my office and with all the work I'm doing to this room, how sad would that be! We also will need an outlet over the new counter once the new cabinets are here. 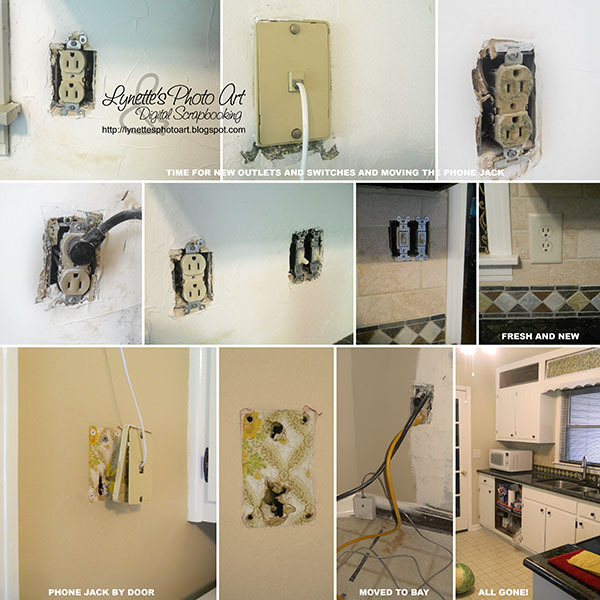 I watched a lot of tutorials, took notes and dove into switching out the outlets and switches myself. We finally got them all done and working, but DH stripped a screw and broke it off in the blue box which is tiled so closely around now that it isn't coming out. Very not good news. Aren't renovations fun? :) So, that will be one more thing for the electrician I guess. Thanks for joining us on our adventure with The Accidental Remodel! Hope to see you next time! Welcome back to Part 18 of The Accidental Remodel! If you've been following this adventure, you will remember that I repainted all my knobs and hinges and re-used them, saving a bundle. As I looked for handles for a desk make-over for my office in the bay window, I found these beauties at Hobby Lobby. Don't you just LOVE Hobby Lobby?!! That and Home Goods are very happy places - mini vacations! So anyway, they were $2.99 each on sale. They are heavy, look very expensive and have good screws with them. The middle bead is a subtle dark brown and black marbling. They feel nice to use too! They seemed too substantial for my desk remodel, so I started wondering about the cabinet drawers. Since I'd need more of the old knobs (painted black) for the new cabinets anyway, a plan formed. I'd use these three drawer knobs for the new cabinets and then use these pretty new handles for all the drawers and the pantry. I did this on the MDF desk first to see how it went before my WOOD drawers. 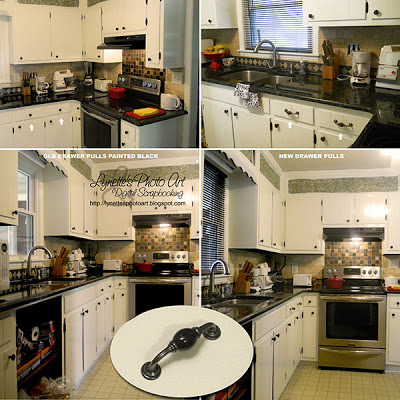 Though the chunky old wood knobs had two holes, they weren't the right distance apart for the new handles. I marked the locations of the new holes and drilled them, testing for fit. It wasn't hard. Then I used spackle to fill the old holes. Cure, sand and paint. It worked fine. I was still worried about my cabinet drawers. They had holes for a single knob and I needed two holes for the handles. The wood is routed into grooves right where the hole is too. I did the same procedure with them, only gave more care to forming the spackle not just to fill the hole, but to mimic the routing. It looks great! Yeah! Thanks for joining me again and I hope you drop by for the next installment! It's really looking great! Welcome back to Part 17 of The Accidental Remodel! Ever since this project began, I've been pondering colors for the walls. There won't be much wall showing with all the soft white cabinets, windows and doors. Originally, I wanted a light, bright, soft room...maybe a soft blue with the white. As you know, that's history as materials in my budget turned the room a different direction. After I finished and sealed the backsplash, I came up with three colors that went nicely with all the colors in the stone backsplash, the granite and the Mascarpone soft white wood. There was a carmel, a very soft yellow and a dark taupe. When we ended up going with black (I know, I still can't believe it!) blinds, the dark taupe was out. It would shrink the room way too much. I have sanded, plastered, primed several times and been very aware that once I tried wall color, that I'd have to prime several times to cover it for the next try, so I've been very cautious. The paint chips looked good in all lights. Last night we got a "great" idea to be daring. We went and got a sample of a burnt sienna. I finally bit the bullet at 10PM and started painting the "carmel" first, then the sienna. Oh my goodness! The carmel turned sick pea green on the wall! And the sienna....well, see for yourself - it turned bright orange. They didn't look like their chips. They looked horrid. This morning I wanted that orange gone fast. I still had the other two of the original three colors, so I painted an area with them each of them. It wasn't an option any more, but I used some of the dark taupe anyway. The very light yellow turned into some truly unpleasant gold color. Ewwww! Update: Yesterday and today we tried colors seven and eight. It's not love, but might have found something we could live with. Today it occurred to me, the paint is here, it's paid for, why not try it? Maybe it only looked horrid because it was next to what it was supposed to be. So I painted every inch that will have wall paint showing, and you know what? The color I didn't order out of 10 is just right! We are both happy with it and at peace tonight. It brings the color of the backsplash around the room to bind it together. It is dark enough to make the woodwork pop, but light enough to not darken the room. Now that it's the only color on the walls, it looks comfortably neutral without leaning to pink or green, though it looks different than in these pictures. Hallelujah! How ironic is that? Praise God! The paint trials are OVER! On with the next part of the remodel! I hope you'll come back and join us! UPDATE: I couldn't resist - it's time for another before and after! I think it's amazing! UPDATE: I had never used flat paint before, but I loved the idea of the flat finish on my walls next to the high gloss trim and cabinets, so I tried Lowe's Valspar flat. Last night I had DH hold a picture frame against the wall so I could see if I liked it. Just that left such dark marks on the wall that I couldn't even wash it completely away! I have to repaint the entire room! I'm using their finish just below the semi-gloss, satin. Hope it works better, but sad to loose the flat finish. Welcome back to Part 16 of The Accidental Remodel! Today is all about window treatments. Oh how I have agonized about them since this remodel began! The bay window is a unique challenge, especially since my "office" is tucked into it. The exposure it gets makes it swelteringly hot and so bright that I can't see to work at the computer each afternoon. It also has only 1" depth after replacement windows were installed years ago. We have brainstormed all manner of options and I've spent countless hours making mockups in PhotoShop and shopping for fabric, here and on line. We wanted 2" faux wood blinds, but didn't have the depth to be able to securely mount them and they'd stick out a lot. We found a merchant on line that offered 1 1/2" and 1" faux wood, but after many weeks of waiting and many phone calls, we never received sample brackets to see if we could hang them. DH decided he wanted the cheap plastic mini-blinds with roman shades over them for when extra protection was needed. My head has been spinning trying to figure out how to do that mechanically. I went ahead and bought the cheap plastic light filtering mini-blinds at Lowe's, but the "whites" looked gray next to my new soft white wood. I got the same at Home Depot and the color was better. They also had two options Lowe's didn't, room darkening and blackout in the cheap plastic mini-blinds. The blackout was actually black. Who could use that? I had bought so many different shades, blinds etc. just to hold up and try, only to return, so why not try these? Neither of us held a bit of possibility for the black blinds, but when DH held them up, they actually looked kinda fantastic in our black and white kitchen. As of today, all four blinds are up and I've adjusted the lengths of all four too. We were surprised to find they are made differently than our last ones 15 yrs. ago. Sadly, they do darken and shrink the room, even when turned to the open adjustment, but they do look nice, bringing the black of the counter and hardware across the room. When they are pulled to the top it's not an issue. When the new wall of cabinets is in and I've painted them white, I think that will help too. We have yet to have a sunny day to see if they will block enough sun, but we are very hopeful. We did four windows for $83.34. Not bad! It's so crazy - I set out to make this a light, bright, soft kitchen and I have just put up BLACK blinds! Life can be so funny! We had been leaning toward a dark taupe color for the small amount of walls that will show, but now with the degree this has darkened the room, we clearly need something very light. As soon as the blinds went up, it seems like I need to use a color from the light stone in the backsplash for the walls. There are many shades of yellowish/beige in the stone. I think that will bring continuity to the room, given that the areas of paint are so disjointed by cabinetry and the fridge. The blinds solved the ceiling light issue too. Our existing light (which was a Lowe's/Home Depot clearance find 15 yrs. ago) is now the glowing jewel of the room! The black lines in the light absolutely love the black blinds! Just FYI, when I got the light, there was one piece of the black edging missing from a bottom piece of glass. That's why it was crazy cheap! I just took a Sharpie marker and drew it in. It's lasted 15 yrs. and even I have to look very hard to find it! The blinds actually look much nicer than in the photos. Onward we go! 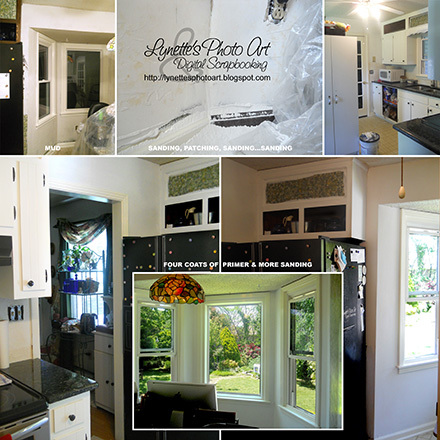 I hope you come back to share the next installment of our Accidental Remodel! 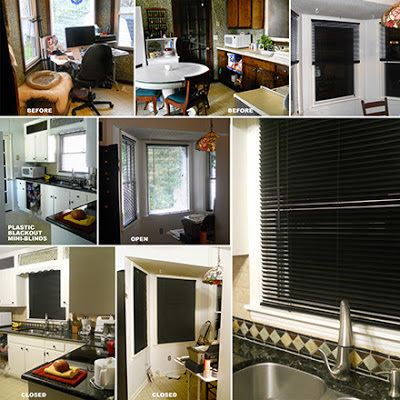 UPDATE: A review on these "blackout mini-blinds" - they do not block out all light like true blackout fabric does. They do however block enough to perfectly solve my problem! We are very happy with them. To my surprise, we found that rather than closing them entirely the only direction they will close, if we turn them as far the other way as possible, they don't close, but they block much more of the problem light than fully closed! You can still see out easily, but the problem light isn't a problem any more and it's SO MUCH COOLER! Yeah! Thank you Home Depot!!! At night we turn them all the way closed (the other way) and then we can't see out and no one can see in. The only sadness is they show dust a LOT! When we took them out of the box they showed dust! When I dust them, they don't come clean. But it's not a big enough issue to dampen our joy with them! The cooler temperature is WONDERFUL! I'd happily recommend them to anyone with a similar problem. 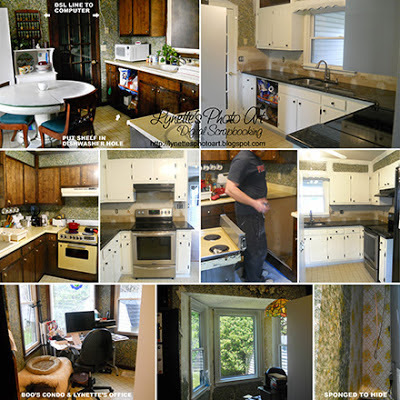 Welcome back for Part 15 of our Accidental Remodel! At this point, I am still waiting on our friend to help move an outlet, put a new one in and move the phone jack. DH and I spent a couple of days, yes, seriously, and changed out all nine switches and outlets over the existing counter. They are all finally happy, except a double switch that DH snapped a screw off in it's blue box. Friend needed there too. He's tried to come for so many weeks, but something always comes up. We don't even have a new date now. It does have to be done before the new cabinets can go in as they will block the one being moved. So, nothing I can do about the electricity for now. Cabinet guy (who has had our money for months) is still not returning DH's calls. He'd originally said sometime in July for the work. Please join us in prayer about this. So, nothing I can do about this either. That leaves window treatments. After they are chosen, I can settle on wall paint and do that. Then, after the electricity and cabinets, I get to paint the cabinets, go through the granite thing again and then another tiling job for the backsplash. A looooot more work, but I'm much closer than I started! WOOOHOOOO! Today I'm back trying to decide what to do with the four windows. It's a bit of a special situation because three of them are a bay window that my office snuggles into. Yep, right there in the kitchen! The exposure makes it blinding and boiling during afternoons much of the year. So much so that I have had to keep huge pieces of cardboard to prop in the windows so I can see my computer screen. DH says no more of that. So, whatever goes up now must be able to really block the sun out (and hopefully the heat and freezing cold). Another issue is that it's an older house and when we had the replacement windows put in years ago, they put quarter round in all of them. This makes mounting anything in them truly less than wonderful. No flush surface. They also left only 1" depth to work with. We wanted 2" faux wood blinds as they would look nice, clean nicer and block the sun out while still allowing us all the flexibility of "peeking" and endless adjustments of light. They need way more mounting space than we have. We found 1" and 1 1/2" ones on line, but after about a month and a half waiting and several phone calls, the sample brackets still haven't come. Without them, we can't be sure we could adequately mount them to support all that weight (compared to the cheap plastic mini-blinds we had). It's also caused us to be concerned about dealing with this company. It's sad because they were our absolute choice and now we aren't thinking we'll risk it. Extra sad because we were going to put them in our living/dining area too so we could see the TV without all the reflections. They loose! Since the beginning of this project, I've done mockups in PhotoShop to try to give us an idea of our options and how they might look. The first generation I sketched by hand. I scanned them and "traced" them in PS. As work progressed, I take photos and pull them into PS. I leave what's already remodeled alone and alter the areas we are deciding on, so we can see them next to reality. It's been tremendously helpful. There are three paints that go well with the cabinets, granite and tile. I have been very distressed that I can't successfully represent them in PS. FAIL! DH even helped me Google the hex code for them, but when I plug them in PS in the layouts, they don't even remotely resemble the paint chips. I assume this is due to the back lighting on the computer. 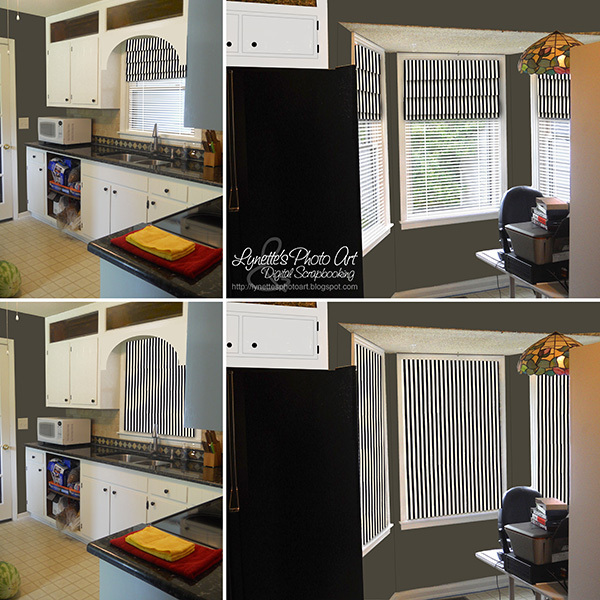 I've done a bunch of mock ups for window treatments. Different styles. Different products. DH still wants blinds, which is great with me, but like I said, we can't get the bracket to try out and now are concerned about the company and it's the only company we know of carrying them. The cheap plastic mini-blinds fit, but don't block enough light. There are very few options left to me to soften and brighten the room. Fabric and paint are mostly it. I can't pick a paint color until I have a fabric, or know if I'm even going to use fabric. If we use just blinds, we wouldn't need it. I'd done some topper mockups, but with the arch over the sink, I wasn't liking how fabric was looking. I have combed all the fabric stores locally and didn't find anything I liked. This turned out good because once the backsplash was done, the entire look of the room changed and my choice would not have worked any more. I don't like the idea of buying fabric on line. I want to see it to know the scale of the design and the genuine color, not just whatever my monitor shows. I want to feel it to know it's weight. I want to see the dye-job up close to see if it looks like a quality piece. But, alas, I'm to the point that I can't do anything else but windows, so I have been spending HOURS on line looking at teensy pictures of fabric. I found two fabrics I might like. So, of course, I spent all day making mock ups with, actually four fabrics, each with poor representations of the three paint choices. I took a screen shot of the tiny picture of the fabric. I worked in PS to build it into a larger piece. Some stores kindly put a ruler under each shot and I can use that to be sure I'm creating something close to scale. Then I open the two current mockups I am using (that reflect work done till now). I have one for each side of the room. I used the fabric samples I'd created to see how they'd look in the room, with all three paint colors. I was thinking roman shades, so I made two versions of each combination; one with the shade pulled up and one with it all the way down, to get a sense of what the room would feel like with each fabric. I wasn't comfortable with the "down" looks, especially since I was trying out some daring fabrics. The one over the sink would be down all the time. The three at the bay would be down much of the time. Not love. It was accidental at first...I forgot to turn off the mini-blind layer. But I liked how it looked with the roman shade OVER the mini-blind. I know it's unconventional and my mind spins trying to figure out how I could install such a thing, and me with only 1"! Oh and to make it harder, I want inside mount so the lovely new soft white painted window frames will frame it all. But, if I can figure a way, we could have the versatility of the mini-blind AND the additional sunblock of the roman shade when needed. The rest of the time they would look like toppers and I am liking that look. DH is in love with this. Not sure how I could pull it off. I did mockups for four fabrics, each in three paint colors, but I'm just going to share my favorite two. My favorite is a bright, bold paisley. I'm shocked I even looked at it as I have HATED paisley my whole life. 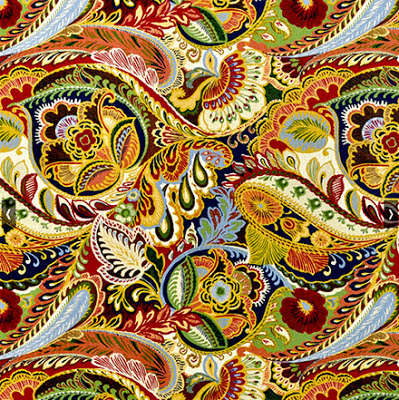 I didn't even think of this as paisley until my daughter called it that. DH loves it best too. The paisley pulls the room together and brightens it. We had wanted that rich red to be our accent color as we already had some items that sit out in that color. With the granite and cooktop issue of dishtowels not absorbing water from them, I ended up with these brilliant yellow micro-fiber towels from Sam's Club. I couldn't find my red anywhere. So, this fabric has both the red and yellow and the black from the granite. It also has lots of other bright colors that would allow me to keep the lime green and the bright blue knives my daughter gave me, in the butcher block like I had been. This fabric allows many colors and though it's very different than the backsplash, I'm hoping that it will work when all the red and yellow things are out. We liked it best with Valspar's Empire on the walls. It's a dark putty type color. I'm a little concerned with shrinking the room, but once the new cabinets are in, that entire wall will be white cabinets and backsplash and the other two walls already are all white cabinets. There will be very little of the room actually a wall color paint. Second choice is Behr's Stable Hay, a soft, neutral yellow/beige. I believe the pattern is larger than in my mockups. It has a 27" repeat and my widest window is 35". It's Richloom Giverny Cameleon from OnlineFabricStore. My second choice was these stripes, but DH didn't like them at all. I like adding color better though. So what do you think? Do you buy fabric on line and want to suggest somewhere? Do you know a fabric that you think would work well in my kitchen? I'd love to hear from you. Oh, BTW the third paint color under consideration is Valspar's Cincinnatian Hotel Carl Tan. I consider it a carmel that is in the neutral family. I hope you keep me company as I continue with my Accidental Remodel! You won't believe what we ended up doing on the windows! Come back and see! GREAT NEWS! I'm so excited to share this with you! My sister saved over $800 on one prescription and called to tell me about it. She told me about two completely free places that really help with prescription costs, whether you have insurance or not! Neither asks for personal information and they work fast and easy. You can use it instantly! Tonight is the second time I have used one of them and tonight...drum roll please...I saved over $800 on a prescription!!!!! Praise God! Yeah! It made the difference between getting it and not getting it. You know the drill. The deals change all the time, so you need to either check when you have a prescription to fill, or sign up for them to notify you. The first time I used it I only saved a little, but wow tonight! I paid $29.80! Ok, the one I've used is www.goodrx.com. You type your zip code and the name of the medicine. The next page lets you select the dosage and number of pills. It gives you a list of the cheapest places for that prescription in your area. You just print the coupon, take it to the pharmacy and give it to them when you drop off the prescription. Voila! Done! It's AMAZING! It hasn't helped with most of my meds, but wow what a blessing on this one tonight! The other is www.rxassist.com. I haven't used it, but you can print a card on line or ask them to send you one. It took a l-o-n-g time to come in the mail, but since you can print one, so what! God bless these people for this help. Even if it only helps once in a while, it's still great help and it's free and easy! I hope this really helps you as it has me tonight! Welcome back to Part 14 of The Accidental Remodel! So, remember the delema about what to do about the backsplash? Well, ultimately DH wanted "some tile". Sadly, we had nearly killed ourselves getting the wallpaper off, then I had mudded texture on just trying to move forward, so we had to sand it all down smooth for tile. More irony! Back to Lowe's. I liked glass tile, but we all agreed that would add to the coldness and modernness of the room. I do love stone, but it wasn't the soft bright look I had wanted for the kitchen. With money ever primary, the cheapest tile I found were some ceramic 4x4" tiles for 16 cents each, but they were bright white and looked horrid with our off white cabinets. The next cheapest was the tumbled marble 3x6" tiles, $4.48 per square foot. I did a bunch of PhotoShop mock ups and let everyone in the family vote on the design. I added the slate border and small slate squares behind the stove. I had always wanted to try tiling. I watched a bunch of YouTube videos and asked a lot of questions at the store. I was extremely nervous at each step of the process, but being quoted $1,400 in labor alone, it was do it myself or it doesn't happen. The job was much more physically demanding than I expected. I can't come near reaching the corner. I had to use a stool, then climb half on the stove and counter to even touch the last foot on each side of the corner. Made all the tiling steps so fun! LOL! Of course, I couldn't do something simple. I had to use three different tiles and two colors of grout. I ended up having to pull almost every stone off their backing to shift stones either for appearance or to make spacing more uniform. The cheap slate border ($3.98 12") was a problem not only because of vastly messed up sizes of stones, spacing and overall heights, but the thickness of the stones. There was a huge difference in thickness and when it comes to grouting and caulking, it's a big issue. Of course, I'm a perfectionist, but you are forewarned about this border! My family is impressed with the before and after and like it ok. I feel the tiling looks good, especially for a first try. But it gave the room an entirely different feel. Yes it warmed it up some, which is good, but I wanted light, bright, soft and color. What I have now is elegant, weathered, old world, darker. I am shocked how once the granite was in, I lost control of the design. It's like the materials available to me (financially) have funneled me into a completely different look than I was going for. I'm shocked. It's not ugly, it's just not at all what I have been doing all this labor for. So crazy! Price and materials have determined the design, not me! LOL and I get to do it all over again when the cabinets and new counter are in (please God protect us!). At this point, I'm in the 72 hr. cure period for the grout before I can seal the stone. Then that will need 72 hrs. I am being delayed because they had to special order the co-coordinating caulk for between the granite and the tile and it just came in this evening. So now the 72 hr. cure starts all over before I can seal and they recommend two coats of sealer. 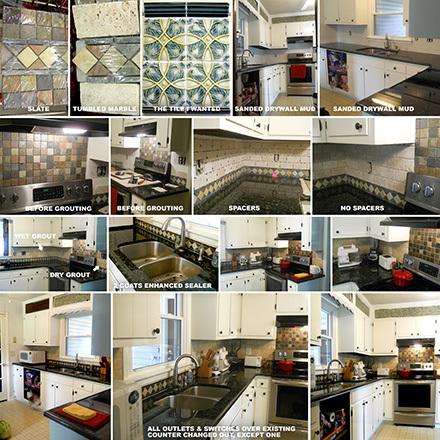 Update: The caulk couldn't hardly be farther from matching the grout! It has really messed up all my work. :( Trusting that when it cured it would match, I went ahead and did where all the existing counter and backsplash meet. Lovely don't you think???? 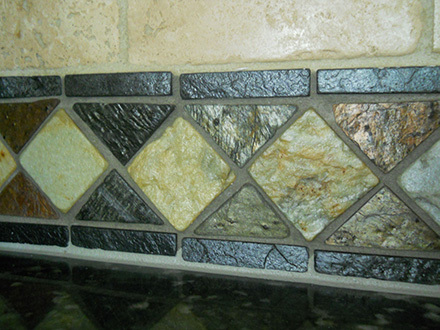 The grout is Biscuit on the lighter tiles above and Pewter on the border and supposedly Pewter special order matching caulk below on top the granite. :( Needing to be able to use the counter and cook again, I went ahead and sealed after 72 hours of it curing. Now I'm told that any other caulk, that actually matches, won't stick because of the sealer. When they come, I will have to do the new counter/backsplash on the new cabinets, with this same WRONG caulk so it will at least look deliberate. :( What was blending in with the granite now has a nearly fluorescent dividing line. Big unhappy. In half an hour the sealer will have had it's 72 hr. cure, so I put things back on the counter. They look odd to me now. Out of place...LOL and OLD! :) The backsplash feels kinda waxy. But hey, at least we can return to using the counter and using, or trying to learn to use the new stove! Yeah! Oh how I long for cabinet guy to come put the new ones in so I can paint them and we can move closer to NORMAL life! It's been weeks now and he won't return DH's calls. Concerned as he already has had our money for months. Not looking forward to finding somewhere to make the granite for the new cabinets' counter after the nightmare we've had with the first fabricator. This will be a small job and I fear won't get a good price. Also, the first guy has our slab and I'm just hoping we can get a close enough match that it won't matter. It seems to be a fairly consistent granite. THEN another tiling job, the wall paint and window treatments and maybe then done till hopefully one day being able to replace the floor! :( Just realized that I will have to seal the new backsplash the same way this is to make them match...just like the clashing caulk. This job surely hasn't gone the way I planed it. The family is still happy with the change and that means a lot. See ya for the next installment! Still a lot more to go! Welcome back to Part 13 of The Accidental Remodel! Having removed all the wallpaper that would come off, I wound up having to sand the transitions, skim coat with drywall mud and then sand, then patch, then sand, over and over and over. This shows it with two coats of primer over the mud now. We are astonished how bright and how much roomier the room feels now! Is tempting to paint it white or something close! Most of the room will be the off white cabinets. There will be very little wall paint...all trim work, of course! The bay will be the place the paint really shows. I must say, my stained glass light never looked so good! With the black and white, I suddenly had a cold, modern kitchen. This wasn't were I was going! 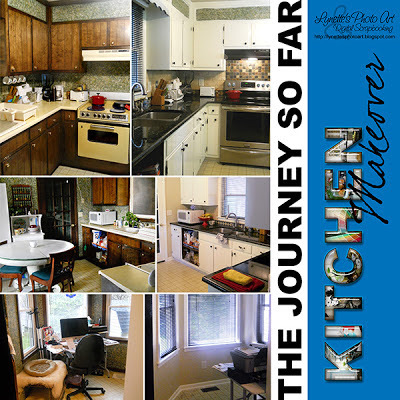 I had chosen soft white cabinets thinking of a light, bright kitchen with color. Maybe a soft blue. The only other elements left to soften and warm the room are backsplash, walls and possible fabric on the windows. I have looked everywhere locally and not found any fabric I like for this. DH wants 2" faux wood blinds, but with the replacement windows, we have only a bit more than 1" depth and that won't accommodate the hanging brackets for this heaver blind. The faux wood would be fantastic as that is a veeery bright/hot place to work (my office). I have had to put cardboard in the windows when it's bright as the plastic mini-blinds simply don't do it and I work in graphics. But these blinds would be much heavier and wouldn't have much support due to the lack of depth. To make it worse, when they put the replacement windows in, they added quarter round trim! So we'd be screwing into quarter round or have to somehow remove enough from both sides at the top to mount the brackets to the flat surface. With having just put many layers of primer and paint on them, that doesn't thrill me, and I'm concerned about that kind of activity harming the seal on the windows. One is already leaking when it rains - the big window in the middle. We found a place on line that sells 1 1/2" and 1" faux wood blinds. They were supposed to send samples of blind colors, which they did, and of the brackets so we can see what would work, and they haven't. It's been a month and we have called several times. Still no brackets. Fail. Welcome back to Part 12 of The Accidental Remodel! Now that the granite was in, things started getting weird. I had chosen soft white cabinets thinking of a light, bright, soft kitchen with color. Maybe a soft blue. But once the granite went in, it seemed the only thing to do was black hardware. 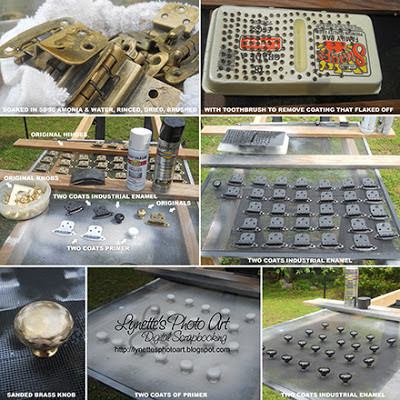 I had gotten all new knobs years ago and loved them. They are called mushrooms and are heavy brass knobs, very comfortable to use. 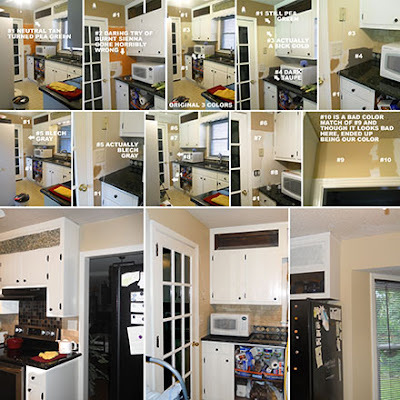 They are still in perfect shape, but the gold didn't seem to go any more with the stainless and black stove, black and silver fridge, black counter, stainless sink and white cabinets. So, like any good DIYer, I decided to try painting what I had. I found an industrial gloss black spray paint and the special primer it recommended at Lowe's. Painting them was going to be tricky. Spray paint was definitely the way to go. It said two coats of primer and two coats of paint. I knew it would be important that the paint adhere well as these get LOTS of use. I started by soaking everything in a 50/50 amonia and water solution - OUTSIDE! Then I rinsed them thoroughly and set them to dry. As they dried, layers of a protective coating flaked off the hinges. Several times I cleaned them with a toothbrush to be sure it was all off. Finally it was all gone and I felt good about my chances of the paint adhering. The screw heads (for the hinges) needed to be painted, but not the threads. I punched them into the top of an egg carton! It held them nicely in place and protected the threads. Pretty happy with this one! I sanded the knobs till no shine was left, and, frankly, I liked that look! The knobs would be tricky as paint would need to reach places it couldn't from sides and top. I set them on an old window screen I keep for odd jobs like this. This enabled spraying from all directions, including up from beneath to get the underside of the handle part. It worked great! Hope you drop back by for the next installment! Welcome back to Part 11 of The Accidental Remodel! Thanks for stopping by! Today is all about the countertops. Here's yet another of those things in life you think are just, "Wow, a granite countertop - wow! Dream come true!". It didn't turn out that way. So, we picked a granite company. The owner was so nice and told us all these big jobs he'd done and what gorgeous counters he'd make us. We picked a slab of Verde Butterfly, the only non-ugly option in the lowest price range. They made a template. They demolished and removed our counters and removed the sink. Then came the magical moment...they were carrying the first piece of granite in... Be still my beating heart! Only...oh my goodness it looks AWFUL! As dull and flat, shineless as a rock in the yard! 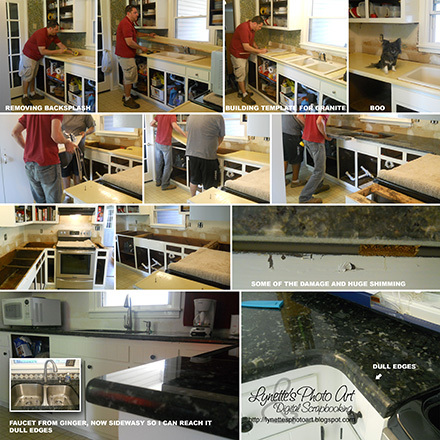 Having never gotten granite counters before, I chose to be silent, assuming that at the end of the installation we would have the beautiful counters we were promised and that we'd paid for. None of it shined when they left. I couldn't even go in the kitchen till the next afternoon. It was horrid! Whoever heard of a granite counter that was dull??? And the edges were the worst! There were man-made chips and scratches all over it. In my struggle to cope, I thought, maybe they just didn't seal it right. What the installer did was just wipe it. I watched videos on how to do it, went and bought some and spent an entire afternoon sealing and buffing, trying to make it shine. Heartsick. This and the new cabinets (that are hopefully coming) were the only work we paid others for. I am doing all the rest myself, with a tiny bit of help from DH. We dealt in good faith. We paid a LOT. It was unimaginable. Who ever heard of dull granite counters? At my height, the edges were especially important as that's what I'd see most of. I went back to my daughter's and looked at hers just to be sure I hadn't been crazy my entire life thinking that granite and EDGES were mirror shinny. But I was right! We discussed the problems with them many times and twice they came out and would put stuff on it and rub. When he rubbed it with denatured alcohol, the top shined a little, but the edges never did. He told me my "eyes were playing tricks on" me. But they are the same eyes that see all the other granite, even the granite in his show room. He said it was shiny and there was nothing more to do and he stands behind his work. I liked the man. He ripped us off big time. I searched the net for a company that could/would make it shine, but they all said it must happen in fabrication and cannot be done in a home. I never shared their name, but describing my problem to a local dealer who was obviously very prosperous, and they said that my fabricator doesn't have the proper equipment to make the edges shiny. This man sold us this product KNOWING that it would be dull. He does this to every customer. Heartsick. It's just devastating. And they tore up my paint job in many places, even though I alerted them to it and asked they be careful. I also didn't get the turn table they had contracted to provide. So, this is a very sad installment, but...that's real life isn't it. Again, it's one of those things that happens to you and you never dreamed of such a thing! Come back next time to see what's next in The Accidental Remodel - I promise it's good! Oh! I promised you another irony of life in an earlier installment...about the faucet! So, I'd been upset that they ruined my daughter's faucet when they put in her granite backsplash while rebuilding her house from the tornado. The faucet has to be sideways about 45 degrees and I hate it! Well, the irony is that once DH and I got the plumbing done with all new PVC and the new faucet my daughter had given us, I found I couldn't reach the handle! No kidding! The new counter is deeper as granite has a greater overhang, and my old faucet had the handle that comes out toward you. This one has a little handle on the side and backwards is hot!!!! I could barely touch it with the tip of my longest finger, surely not control it! Talk about despair! And I don't have a dishwasher, everything is by hand! So the end of much consternation was that we UN-installed the faucet and RE-installed it with the handle IN FRONT!!!! It looks funny and is still wildly inconvenient, but I CAN TOUCH IT! When I am rinsing a glass, it hits the handle and turns the water off! LOL Again with the things in life that you innocently think are just nice things, then when you get them they make life soooo much harder! It's so alien in my kitchen now. These things that sounded benign and nice have all turned out to be far more upkeep and all need a learning curve - the stove, the faucet, the sink, the counter! It's crazy! I don't know how to do ANYTHING any more! Pretty much afraid to touch anything! LOL!